You have one sentence and about 10 seconds to get your prospects attention to try to set an appointment. 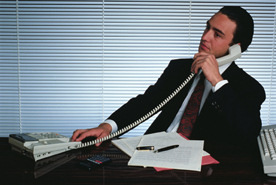 Cold calling prospects by using the telephone is usually the insurance agents toughest problem to overcome. During my phone conversation I would always try to do some quick investigative work by asking a few key questions. Continue reading this article for more specifics. Sales Tip: This is the first in a series on setting appointments. in the link at bottom of page, we will be discussing how to get into the right mindset to start phone calling cold prospects and we will show you how to remove the fear of phone calling reluctance and get the ball rolling? when you are calling prospects? What do you think the purpose of the telephone is when you are cold calling prospects? This is where many agents just don't get it. The telephone is a time saver. It allows you to maximize your time. Its only purpose is to set an interview, if you are calling for appointments. You can not sell a policy over the phone or get a signed check. You are cold calling prospects to try and set selling appointments. Especially if you are calling during those golden hours of 6 pm to 8:30 pm. First of, if you have read the section on building your daily action plan. we talk about earmarking of a block of time when making phone calls to set up appointments. I bring this point out because when you earmark a block of time to make phone calls, it is suppose to be used for that purpose only. You should not get into lengthy chit chat sessions with clients or prospects. The reason I emphasize these points, is that over the years I have observed that many of my new agents always ended up getting into some heavy conversations trying to explain something to a prospect on the phone. They end up wasting valuable calling time, and you can not get an app signed over the phone. When in reality, they should turn those lengthy chit chat situations to their advantage. “Mr. Prospect I appreciate that, but it would be much better if we could get together and talk about this subject , as it would be much easier for both of us ,if I were able to use my charts and diagrams to answer that question for you. Are daytime or evening appointments better? “If they don’t want to grant an interview at that point, they probably are wasting your valuable calling time anyhow. Remember this, when cold calling prospects, you should never be dragged into a useless conversation when you are using your valuable calling time to set appointments. Closed end questions can only have a yes or no answer. If they say no, where do you from there? We will have more on open and closed end questions later. Learning to use open end questions is also very important when running interviews. Moving on, another reason to ask for daytime or evening appointments is many new agents have a tendency to only ask for evening appointments because they think everybody works during the day and feel that they can only see these new prospects in the evening. Not true. Go walk around the mall during the day. Why do you think those stores are open, and who are all those people walking around? Limiting yourself to evening appointments only, severely limits the number of actual sit down interviews you will be able to run each week, thereby impacting your income. Tip: Developing a good telephone sales phone scripts for insurance agents is an ongoing tweaking process. However, once you find a good format, be careful you don't over tweak it and make it worse. When is a best time for cold calling prospects for an appointment? Believe it or not the best time for cold calling prospects is on Sunday evenings. Why? Because people are usually home. Not only that, you do not waste a golden hours evening (Face to Face Interview Time), like a Monday evening , sitting at your desk making phone calls. That gives you that extra evening to run two more interviews, that’s eight more a month or 96 interviews more a year. If your closing ratio is 1 out of 4, this means you could have made an additional 21 more sales a year. How much more income would that have made for you? Maybe the difference between your failure or success. When I was cold calling prospects on Sundays evenings, I would be able to make contact with at least 90% of the people vs. a regular week night when many people are attending committee meetings or church. Also people are usually more relaxed and in a less stressful environment and they have a greater tendency to grant an interview on Sunday evenings. When you are starting out in the business, your company or manager will show you how to use a telephone prompter to make phone calls. It is imperative that you start with that concept so that you can get comfortable on the phone. Once you become comfortable and learn how to run your interview on a stress free basis you may want to incorporate some fine tuning into your phone calling. On the other hand if you are having a great degree of success, don’t change anything. The above information is based on proven and successful record keeping and real life experiences by me and my agents. Have you read our topic page on client communication , if not, you should do so now. Telephone prompter scripts - Here are cold calling telephone scripts that might be of help to you that i found. I hope this article on cold calling prospects will benefit you and increase your appointment setting ratio.